Anyway on to today’s look and it’s all about this silky asymmetric skirt and how easy it is to style this piece. As well as dresses playing a massive part of my autumnal looks, I have also made room for silky slip skirts. They are the perfect substitute for trousers or my beloved jeans and are so effortlessly cool to style. The silky fabric has a relaxed pyjama feel to the design, which makes them very easy to style with roll neck tops, blazers and more importantly knitwear, like here. I just love the two colour combinations and textures together. I feel like these skirts are a versatile piece within my wardrobe and I’m already thinking of what knee-high boots to style it with. Hey guys. I’m currently sat writing this in a cafe in the city centre of Manchester and it’s 19 degrees sunshine in mid October.. can you actually believe that!? I know I shouldn’t complain about this mini heat wave we are having but I am so ready for crisp, cold mornings and to wrap up warm in my new blazers. Haircare products I use and love. As well as crushing on slip skirts, I am also loving my new/old hair again. I took the plunge and went back blonde, it was, in fact, a very easy decision after I tried to grow out the blonde .I just hated my hair being brown, even though it is my natural colour, I just think I suit blonde more. Plus I now feel like me again! 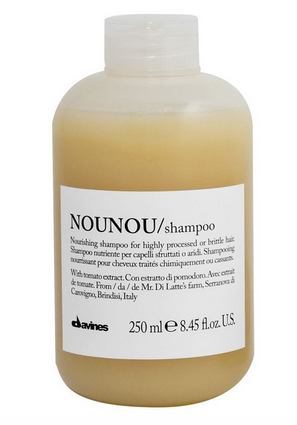 But this time I am ramping up the aftercare on my bleached locks, starting with going back to using Davines NOUNOU shampoo for nourishment and NOUNOU hair mask as a condition and hair mask. Plus not forgetting my anti-snap treatment which I use after I towel dry my hair. I also use Innoluxe Elixir for a leave-in conditioner which helps strengthen my hair and leaves my hair feeling and looking smoother. I’ve also left some other haircare styling products below. For most people they invest in skin care products, I see the benefit of investing in hair care. I’m quite lucky with my skin, but hair needs a lot more attention after years of bleaching. Anyway I’ve also pulled together some other haircare styling products just incase you are thinking of changing things up.